You’ve probably heard that the ocean is full of plastic. Here is a guest post about a current crowdfunding campaign to explore the microbes that colonize plastic. Professor Ana Maria Barral from National University (http://www.nu.edu/), a private non-profit in California has launched a crowdfunding campaign to support a recently started project to explore the microbes attaching to floating plastic in coastal waters. Following up on the exploration of plastic microbiomes in ocean gyre, the research team is studying the shorter-term microbiome of three kinds of plastic materials commonly found in daily life. As a primarily teaching institution, the long-term goal of the project is to crowdsource it to students and community organizations in order to collect data from different beaches and coastal locations. How would the presence of built structures close to the beaches impact the kind of microbes present and their affinity to plastic? How would climate events affect the types of microbes on the plastic? Do they constitute an increased heath risk for beachgoers? These and other questions are at the heart of the project. With limited research funding, the project launched last year with small internal grants and succeeded in validating the collection setup. Just recently a month-long sampling round was completed, and the bioinformatics analysis is currently underway. The funding goal would allow another sampling round when the water temperatures are higher, which is known to increase the presence of genera such as Vibrios in coastal waters. In addition to metagenomic sequencing, the team is also swabbing water and plastic samples during collection. 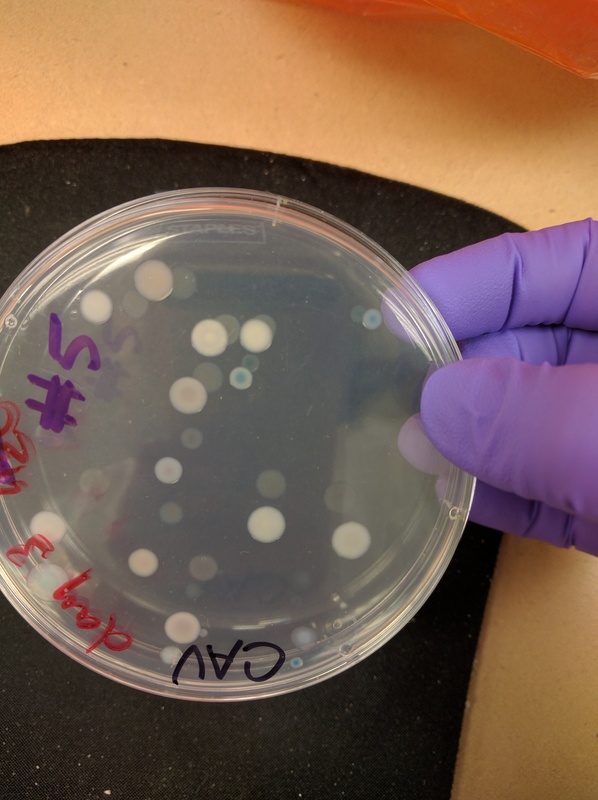 This plate is a day 3 swab of plastic #5 (polypropylene) on ChromAgar Vibrio, a selective-differential medium for Vibrio species. A recent report estimates the amount of plastic in the ocean to be on the order of 150 million tons, with production doubling over the next 20 years. 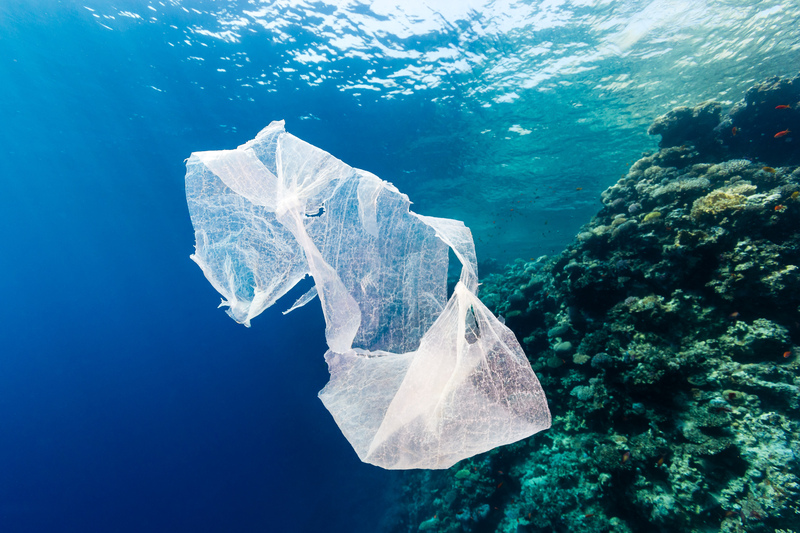 Worldwide, nearly two million single-use plastic bags are used each minute. Plastic affects marine organisms big and small, and the existence of unique microbial populations on minuscule plastic debris called microplastics has been described. However, little is known about the nature of microbes attaching to plastic in beach water. My research focuses on studying microbes populating floating plastic litter that we often see around beaches. Enrichment in potentially pathogenic genera such as Vibrios, could be a health risk for coastal residents and visitors. We could also find microbes degrading plastic! To our knowledge no similar studies exist. There are studies on microbial diversity on immersed surfaces of various materials, mainly from a biofouling studies, as well as on microplastics floating in ocean garbage patches. However, no metagenomic studies exist on microbial populations attaching and living on floating plastic material. The methods used are current (next generation DNA sequencing), and the system can be crowd-sourced and expanded. It also has a strong educational and outreach potential. Our sampling system has been successfully tested in a lagoon, and has generated preliminary data. My immediate goal is to deploy another sampling set in the summer or early fall, when beach water is warmer, to compare with our spring set. Plastic samples are placed in stainless steel cages (similar to lobster traps) and deployed in beach water. Samples are collected weekly for a month. DNA is extracted from the plastic samples and analyzed through next generation sequencing, which describes the total genetic makeup of the population attaching to plastic. I also take swabs from the plastic and use microbiological methods to characterize them. If done early enough I may be able to add the results to my conference presentation in August. Long-term goals include publication of the data and expanding to more beaches, ideally through crowdsourcing.